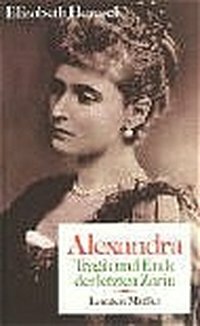 Book | 1993 | Biographie | Alexandra <Russland, Zarin> | More titles to the topic Biographie der letzten Zarin von Rußland (1872-1918).Availability: Items available for loan: [Call number: GESCH 781 ALE] (1). Book | 1972 | More titles to the topic Series: Reihe proletarisch-revolutionäre Romane 8.Availability: Items available for loan: [Call number: GESCH 781 PJA] (1). by Kennan, George Frost [Autor]. Book | 1981 | More titles to the topic Availability: Items available for loan: [Call number: GESCH 240 K] (1). Book | 2000 | Biographie | Rasputin, Grigorij E | More titles to the topic Availability: Items available for loan: [Call number: GESCH 781 RAS] (1). by Melschin, L [Autor] | Ruzicka, Christel [Redakteur]. Book | 1987 | More titles to the topic Series: Im Lande der Verworfenen: 1Availability: Items available for loan: [Call number: LIT 594 MEL] (1). Book | 1987 | More titles to the topic Series: Im Lande der Verworfenen: 2Availability: Items available for loan: [Call number: LIT 594 MEL] (1). by Kerensky, Aleksandr F [Autor]. Book | 1989 | Autobiographie | Kerenskij, Aleksandr F | More titles to the topic Series: rororo: 12477Availability: Items available for loan: [Call number: GESCH 781 KER] (1). Book | 1968 | More titles to the topic Availability: Items available for loan: [Call number: GESCH 781 RAS] (1). by Schachovskaja, Zinaida A [Autor]. Book | 1965 | BIOGRAPHIE | More titles to the topic Availability: Items available for loan: [Call number: ALLG 235 SCHAK] (1). by Kotzebue, August von [Autor]. Book | 1989 | Erlebnisbericht | Autobiographie 1800 | Kotzebue, August von | Geschichte 1800 | Verbannung | Sibirien | More titles to the topic Series: Manesse-Bibliothek der Weltgeschichte.Availability: Items available for loan: [Call number: LIT 222 KOT] (1). Book | 1961 | Netschajew, Sergei G | Necaev, Sergej G | More titles to the topic Availability: Items available for loan: [Call number: GESCH 781 NET] (1). by Lincoln, W. Bruce [Autor]. 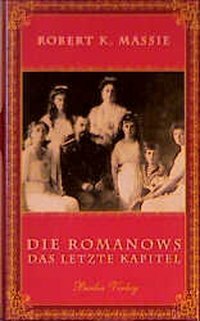 Book | 1981 | Nikolaus <Russland, Zar, I.> / Biographie | Biographie / Historische Persönlichkeiten / Einz. Pers | More titles to the topic Availability: Items available for loan: [Call number: GESCH 781 NIK] (1). by Carrère d'Encausse, Hélène [Autor]. Book | 1998 | Biographie | Nikolaus <Russland, Zar, II.> | More titles to the topic Availability: Items available for loan: [Call number: GESCH 781 NIK] (1). Book | 2000 | Biographie | Nikolaus <Russland, Zar, II.> | More titles to the topic Series: Serie Piper 3001.Availability: Items available for loan: [Call number: GESCH 781 NIK] (1). 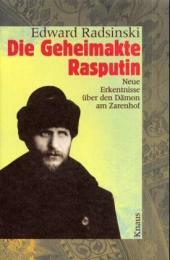 Book | 1995 | Biographie | Rasputin, Grigorij E | More titles to the topic Availability: Items available for loan: [Call number: GESCH 781 RAS] (1). by Massie, Robert K [Autor]. Book | 1995 | More titles to the topic Availability: Items available for loan: [Call number: GESCH 781 M] (1). by Ulam, Adam B [Autor]. Book | 1985 | Revolution | Jahrhundert, 19. / Allg. Geschichte | Politischer Widerstand | Sowjetunion / Neuere Geschichte | More titles to the topic Availability: Items available for loan: [Call number: GESCH 781 U] (1). Book | 1959 | BIOGRAPHIE | More titles to the topic Availability: Items available for loan: [Call number: ALLG 235 SCHAK] (1). Book | 1998 | Geschichte 1917-1924 | Geschichte 1891-1917 | Revolution | Sowjetunion | Russland | More titles to the topic Availability: Items available for loan: [Call number: GESCH 786 F] (1). Book | 1994 | Vorgeschichte | Oktoberrevolution | More titles to the topic Series: Grundwissen Geschichte 2.Vermittelt Grundwissen über die sozialen, ökonomischen, politischen und kulturellen Verhältnisse und beschreibt die gesellschaftlichen Widersprüche, die den zum Oktoberumsturz führenden revolutionären Prozeß förderten.Availability: Items available for loan: [Call number: GESCH 781 W] (1).